Teknimed provides three new ranges of trocars (11G & 13G). • Standard range: intended for percutaneous vertebroplasty procedure. • Confort range: used to guided percutaneous vertebroplasty procedure. • Confort Biopsy range: dedicated to guided percutaneous vertebroplasty and biopsy procedures. The Confort range is dedicated to guided percutaneous vertebroplasty procedure. A 20G chiba needle allows for application of local anesthesia and serves as a guide for the implantation of the needle. The Confort Biopsy range is intended for guided percutaneous vertebroplasty and biopsy procedures. 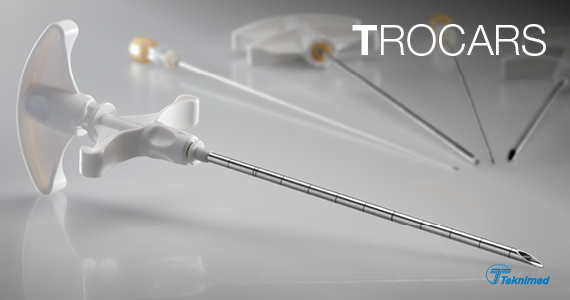 The product is composed of the Confort range needle combined with a biopsy cannula designed with 5 sharp blades to facilitate the procedure. A chuck is provided in order to extract the biopsy sampling from the cannula. The Standard range is intended to percutaneous vertebroplasty procedure. The bevel has been designed for easy penetration through cortical bone. The chuck handle is lockable. A laser marking allows a control of penetration depth.